Simple and ergonomical solution for can-end feeding for low capacity lines. The manual feed is available in single lane configuration. CSW Lowered V-Chute – LVC for aluminium can-ends, normally used for capacities up to 30,000 can-ends per hour. Above this capacity CSW recommends an automatic un-wrapper system. Rolls are positioned in a chute with 30 degress angle. Paper sleeve is removed manually by the operator at an ergonomically operating level. 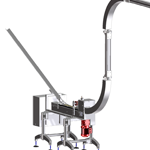 The Lowered V-Chute is positioned at floor level and feeding the ends upwards towards the single end seamer infeed. Please note that submitted energy consumptions are for indication purposes only. Equipment energy consumption depends on actual system configuration for your specific requirements.